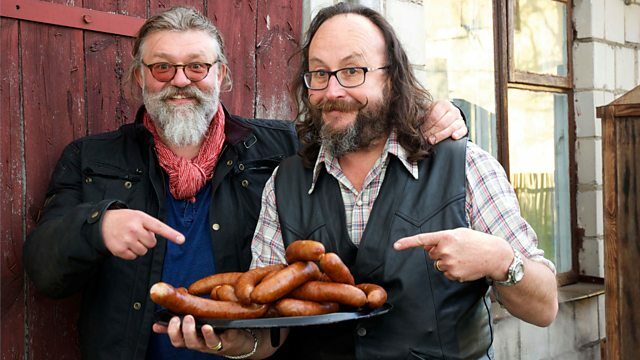 The Hairy Bikers head north on a big Baltic adventure in search of new cuisines. In Poland, they make sausages and cook Poland's national dish, bigos. For two sausage-loving bikers, Poland is the ultimate destination, and the boys are like kids in a sweet shop. Si and Dave make sausages in the Polish countryside with a family who have been making them for generations. They visit the home of gingerbread and Copernicus, the astronomer who changed the way we all look at the universe. The boys examine Copernicus's theory and break it down in true bikers' style - using gingerbread. Both boys are keen to get to know our Polish neighbours better and the fun is mixed with more poignant moments like a visit to the Treblinka Extermination Camp, which has a profound effect on them. Hailing from ship-building communities, Si and Dave can't resist a chance to visit the great shipyards of Gdansk to honour the men and women who stood up to the Soviet regime and helped change the world. They end their journey in the primeval Bialowieza Forest, where they search for the bison grass that flavours the world-famous vodka and cook Poland's national dish, bigos.